LIVE: Downtown Phoenix rally protesting police shootings - We Resist. Shepherd saw the crowd pushing close against the officers’ shields. He tried to push them back. 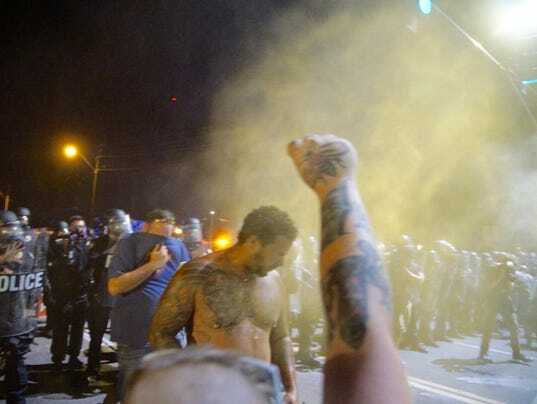 The police sprayed. “It just burns,” he said. Several people have already been sprayed, and the many protesters have taken a stand further from the police line. For Brown, being close isn’t an issue of defiance as much of an issue of morality. He said he’s not entirely surprised, calling it “realistic.” But he has no regrets, and would attend other rallies and protests. “The reward is greater than the risk,” he said. Maupin said he is continuing to negotiate with police, but hadn’t spoken to officers in several minutes. “We’re tired of sitting down,” one man responded. “Is this that Black Lives Count thing?” Ralph asked. “It’s inconvenient, to say the least,” Ralph said. His thoughts on the protest’s motives depended on how quickly they’d get out of his way. “You have to teach them young to get out, stand up for yourself and protect yourself if you have to,” he said about bringing the kids to the rally in downtown Phoenix. Matthew Meinecke, Trump supporter, displayed a torn campaign sign. He said he was at the rally only to support Trump’s presidential campaign. He said Trump will “unite” us. As the march started again, Tanzania Wimberley held her daughter’s hand and nudged her forward. Her daughter, Bre, is 4 and Wimberley said she doesn’t want her to grow up in fear. Maupin told the marchers that they were continuing past the planned ending spot at the Maricopa County Attorney’s Office. The crowd began chanting “hands up, don’t shoot!” as it walked the block of Jefferson Street between 4th and 3rd avenues. The route was nearly complete. The rally was scheduled to end at the Maricopa County Attorney’s Office, 301 W. Jefferson St.
Joseph Toma, 20, walked down the sidewalk, “overwhelmed” by his first rally, with a lit candle honoring this week’s police shooting victims. “All lives matter. Black and blue,” he said, though he said he believes there are good police officers and bad police officers. “The movement, Black Lives Matter, should be recognized,” he said. Frederick Galbert, Daisha’s father, and Trina Washington, her mother, walked hand-in-hand with their daughter as the protest wound through the streets. Daisha excitedly shouted, “Black lives matter!” with the crowd while her mother gave her a tug to keep up. Both of Daisha’s parents said they experienced police brutality in their hometown of Chicago. The crowd stopped and recharged at 5th Avenue and Jefferson Street, stopping briefly to chant “no justice no peace ” before marching on to the Maricopa County Attorney’s Office. This time, nearly all of the some-500 participants joined in. “I think people showed up,” Maupin told the Arizona Republic during a moment of relative silence. About 20 protesters led the march, carrying a 30-foot “Black Lives Matter” banner. The crowd linked arms midway to Phoenix police headquarters, on Washington Street and 4th Avenue. Although a few stray protesters screamed with messages of their own, the crowd largely obeyed Maupin and the other organizers’ requests. The crowd erupted after a handful of counter protesters began shouting anti Black Lives Matter messages from across the street. One displayed a Donald Trump sign, while at least two others purported to be spreading the word of the Gospel, calling the protesters’ message racist. The counter protesters seemed only to embolden the marchers, though the crowd splintered on how to treat them. Some ran to scream in their foes’ faces, while other, equally vocal marchers insisted that attention was exactly what the counter protesters wanted. Dean Saxton was one of the counter protesters. He said when hundreds of protesters rushed toward him and his “Brother in Christ,” all he heard was noise. The screams faded away. Their middle fingers, inches from his face,didn’t back him down. Saxton and Levi Cross have traveled to multiple states to spread what they call Gospel beliefs. They’re both white, both young — Saxton is 25, Cross 27. Hernandez, 60, is a former member of the Brown Berets, a Chicano Nationalist group. He said he saw similarities between his movement and the protesters’. He didn’t plan on burning the flag. Not here, he said. He didn’t want to be arrested. The 18-year-old from Minnesota attended her first protest “simply because of the unjust,” expressing general fear for her loved ones of color and preaching respect for the victims, rather than justifying violence. 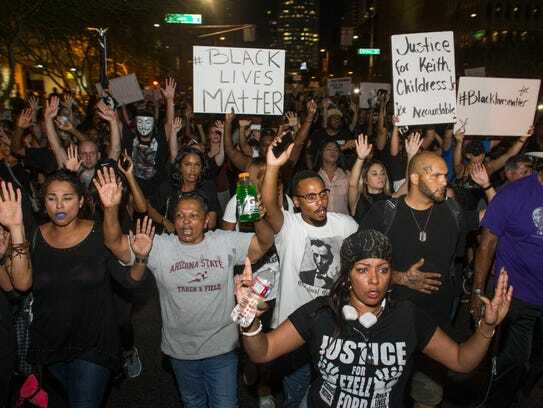 From City Hall, the crowd will march three blocks west to Phoenix Police Department headquarters at 620 W. Washington St. and then to the Maricopa County Attorney’s Office at 310 W. Jefferson St. There will be speakers along the way. Maupin said the movement isn’t anti-police but is rather anti-abuse and anti-excessive force. He said the rally would focus on those issues and the killings of Alton Sterling in Baton Rouge, La., and Philando Castile in a suburb of St. Paul, Minn., this week. The rally was scheduled before the Dallas shootings. The rally is not affiliated with the official Arizona Black Lives Matter campaign, according to the state’s campaign chairman, Reginald Walton. Members of that group were encouraging residents to not attend Maupin’s rally. Republic reporters Megan Cassidy,Shaun McKinnon, Kelcie Grega, Alden Woods, Graig Graziosi, Ryan Santistevan, Laura Gomez-Rodriguez and Kelly Fisher contributed to this article. Next Protests Over Police Violence Spread Around U.S.